Pictured: Dr. Kaneshiro, wearing blue, is 4th from the left. She is surrounded by a few of her mentees – faculty, fellows, researchers, and residents. Friends and colleagues of Bliss Kaneshiro, MD, MPH, see evidence every day of the inspirational attitude and can-do leadership qualities which have earned her a national mentoring award. Dr. Kaneshiro, University of Hawaiʻi (UH) Professor of Obstetrics and Gynecology, accepted the 2018 Robert A. Hatcher Family Planning Mentor Award from the Society of Family Planning at its national meeting in New Orleans in October 2018. The award is reserved for those who have dedicated themselves to supporting and furthering the careers of a new generation of medical professionals family planning. Kaneshiro, a 2001 alumna of the UH John A. Burns School of Medicine (JABSOM), “single-handedly created a new division within the department (the division of family planning) and spearheaded the development of a new post-residency fellowship in our department that started in 2012,” says Dr. Reni Soon (JABSOM MD 2001) a classmate of Kaneshiro’s and a fellow OB-GYN. “Bliss is sought out by learners and trainees at the University of Hawaiʻi at every level,” said Dr. Soon, explaining that Kaneshiro has mentored mentored undergraduate students, graduate students, medical students, residents in obstetrics/gynecology as well as other fields, post-residency fellows, and even other faculty. Dr. Shandhini Raidoo, an OB-GYN and UH JABSOM clinical instructor, says Kaneshiro “creates spaces” for mentees to expand their interests and pursue their professional goals and interests. “She looks for opportunities to make her mentees more visible in professional spheres and fosters a collaborative environment where every mentee, no matter how inexperienced, can voice their ideas,” said Dr. Raidoo. 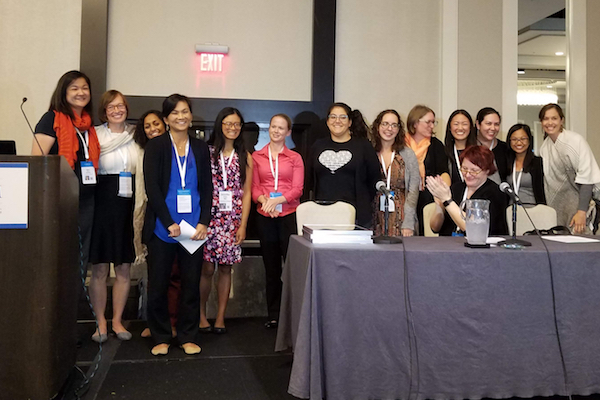 The Board of the Society for Family Planning was particularly impressed by Dr. Kaneshiro’s approach to mentoring and her ability to create a clinical research program with little infrastructure support. The way Dr. Soon describes Kaneshiro’s approach in the workplace makes it clear that passion and effort go a long way toward achieving goals where she applies herself. Dr. Kaneshiro performing a mock exam in the University Women’s Health Specialists offices at Kapiʻolani Medical Center for Women and Children. She also has patients at University Women’s Health Specialists offices at The Queen’s Medical Center and in Hilo. Dr. Kaneshiro is a board-certified Obstetrician Gynecologist who completed an Obstetrics and Gynecology Residency at the University of Hawaiʻi and Fellowship in Family Planning at Oregon Health & Science University. Dr. Kaneshiro received a Master of Public Health degree at Oregon Health & Science University with a focus on Epidemiology and Biostatistics. Dr. Kaneshiro is currently the Program Director of the Family Planning Fellowship, the Chief of the Family Planning Division at the University of Hawaiʻi, and Medical Director of Family Planning for the Hawaiʻi State Department of Health.